The bells stop ringing – Where Is My Teaspoon? I actually can’t believe it’s not Christmas anymore. It’s like I wait and wait and wait for it for so long but it’s over before I know it! I’m back in Cambridge now and am slowly settling back to work..though it is taking time! I just had to share some of the food I ate while at home in Ireland though. This is a photo of a Christmas cake I made for my cousins in Cambridge. I baked the cake Halloween weekend and fed it biweekly until mid December. I followed Mary Berry’s Christmas recipe from the Baking Bible. 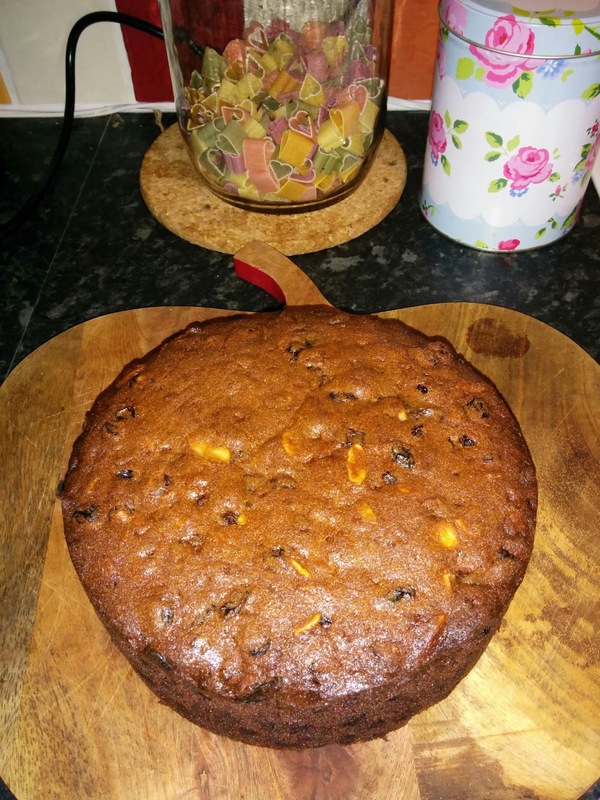 Normally, I wouldn’t be too fussed following recipes completely but as Christmas Cakes take so much time and money to make, it is best to follow a plan to avoid disappointment in December. Also, as this cake wasn’t for myself, I was afraid it might turn out anything less than perfect! This is a photo I sent to my boyfriend to make him jealous while I was at home for Christmas. 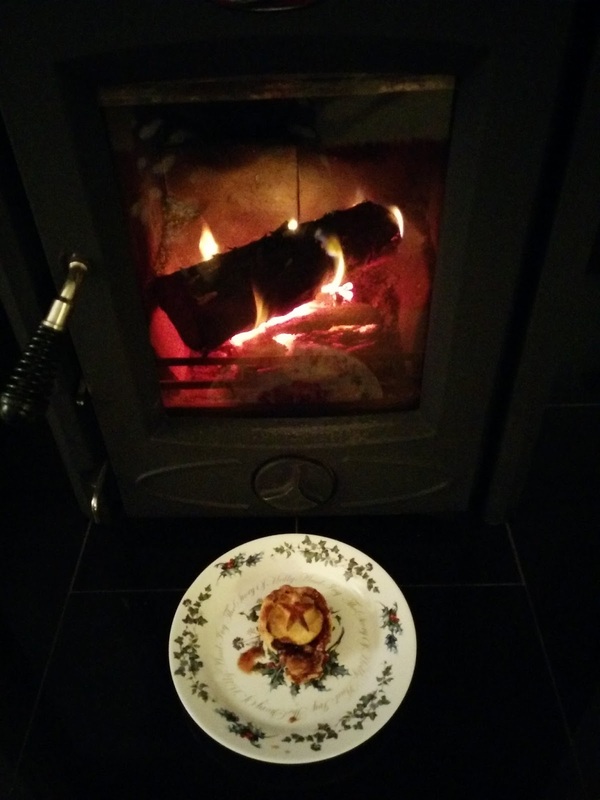 It’s one of my Mince Pies in front of our roaring wood burning stove. Honestly, it was just so nice being at home and such a luxury! My tiny house in Cambridge can’t live to up it at all. I really miss the holly plates as well. My mince pies this year were more robust than previous years. I researched a few different recipes and found Delia’s Traditional Mince Pies used lard in the pastry. What a difference a lump of lard can make. 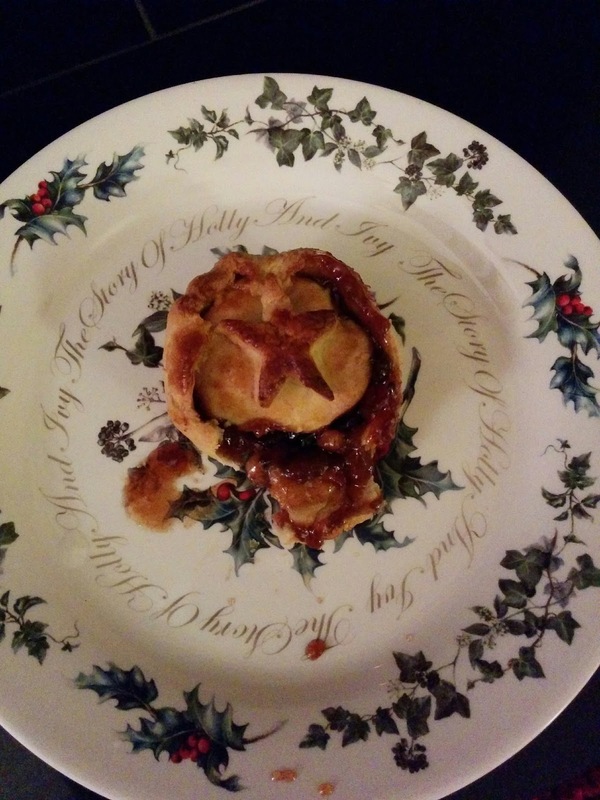 This turned the Mince Pie into a proper, thick, buttery pastry like a real pie. I used shop bought mince meat (as I don’t have the time or the space for anything else at the moment) but added cherries, apricots, brandy and a generous dessert spoon of apricot jam. I filled every pie right up so it would bubble out and create a chewy top crust. They might look messy but I actually think they were the best yet! I’m now just wondering if I have to wait until December to make more.. This photo doesn’t do this Chocolate Biscuit Cake any justice but it’s all I have as it was chopped up quickly for storage during Christmas. I made the biscuit cake using good quality dark chocolate, digestive biscuits, rich tea biscuits, butter, golden syrup and malt powder. 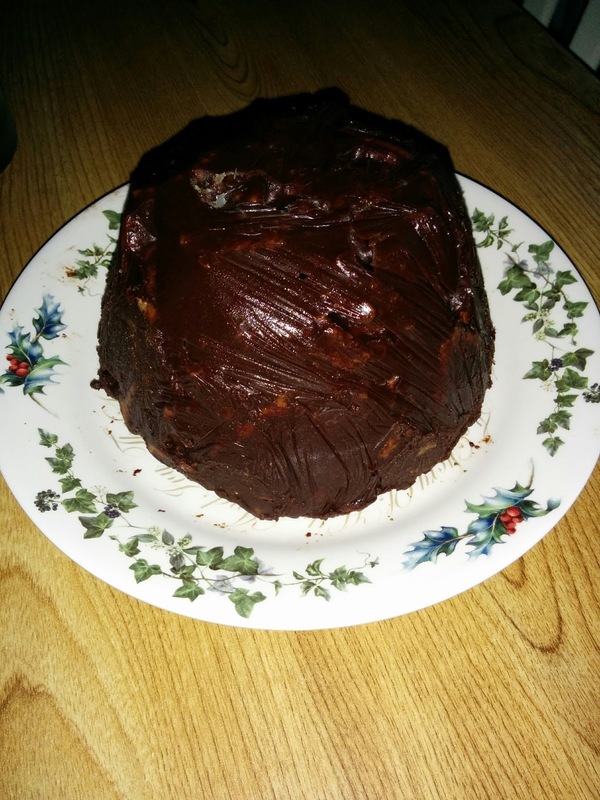 I put it in a pudding bowl to give it the shape of a Christmas pudding, just for fun! Chocolate Biscuit Cake is just a crowd pleaser..there is a reason so many people have it at weddings and parties these days. It’s cheap and quick to make and keeps well in an airtight tin too! Finally, I want to share what I made for Christmas Day Dessert. This year I really wanted to try something new this year but also something that could be eaten after dinner or maybe even the next day. 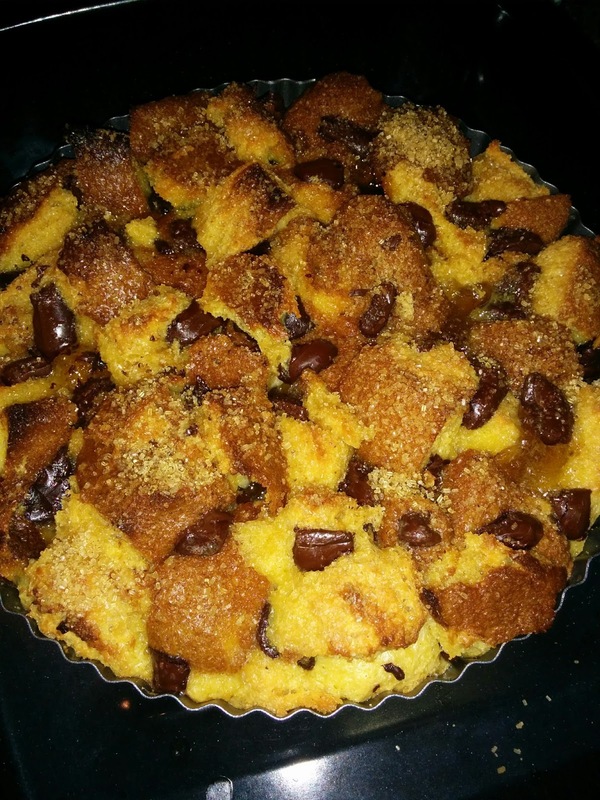 Bread and Butter Pudding is a weird one for me..I’m a bit obsessed with the idea of it but never actually have it. I have had a chocolate orange version once when out for a meal in Cambridge but have never had that “school dinner” version people always take about – probably because we never had school dinners and always brought our lunch in! Jamie calls this one a Bonkers Bread and Butter Pudding but the combinations make perfect sense and it goes down like a dream. The recipe can be found on his website here. It’s definitely one to try next year..or if you can find a panettone between now and next Christmas! Actually, I might remake this at Easter using Hot Cross Buns but using apple jam instead of marmalade. Next Post Can you do the Quick Step?